If some higher being were to tell me my years with Old World wine had to end, it would be to South America that I would turn. By any metric, South America is a significant contributor to the global wine market. Although only the world's fourth-largest continent, South America is the second most important wine-producing continent, after Europe. It embodies a number of geographic and climatic extremes, including the world's highest waterfall (Angel Falls in Venezuela), the largest river by volume (the Amazon), the longest mountain range (the Andes) and the driest place on earth (the Atacama Desert in Chile). This diverse continent is also home to an amazing range of quality wines. A December 2012 Gallup poll cited seven of the world's ten most upbeat countries as being in Latin America, and wine surely plays a role in creating that outlook! For Northern Hemisphere wine lovers, South America challenges some common assumptions. For one thing, southern seasons are reversed, with the autumn and grape harvests arriving in the first half of the calendar year. In the north, we think of grapes typically being grown in a geographic band between 30 and 50 degrees latitude. Within this range, the climate offers sufficient overall warmth for wine grapes to ripen properly. At higher latitudes, the climate is too cold to ripen grapes reliably, and at lower latitudes (closer to the equator) the climate is too warm and often too humid. In the Southern Hemisphere, the same general principle applies. Here most grapes are cultivated between 23 and 45 degrees latitude. But in South America, viticulture extends far up on the slopes and highlands of the vast Andes mountain range, where the cooling effects of high altitude and the more intense solar radiation create unique growing conditions. And nearer the equator, some growers are taking advantage of the year-round warm climate to experiment with vines that produce harvests twice a year and in some locations, even three. Wine grapes are not native to South America, but they arrived as an essential adjunct to European settlement. After Christopher Columbus explored the northern coastline of South America in 1498, word of his discovery spread. From the early sixteenth century onward, European voyages and their accompanying migrations of European settlers led to the substantial exchange of animals and plants between the two continents. It was the Spanish conquistadores, who arrived in South America by way of Mexico, that gave birth to South American wine culture. Although there is anecdotal evidence of indigenous grapes in Aztec civilization, the documented cultivation of wine in South America began during the time of the conquistadores. Led by Francisco Pizarro, they arrived in the sixteenth century, intent on finding treasure and conquering the Inca Empire, whose a territory encompassed modern Peru, Bolivia, northern Argentina, Chile, and Ecuador. Between 1531 and 1534 the Incas were overmatched by Spanish weapons and military tactics, and the victors settled in. As they colonized the region, they planted vines from the seed that they brought with them, from grape varieties that we refer to today as criollas. They depended, however, on local technology: it was the irrigation engineering of the Inca emperor Pachacutec, the builder of Machu Picchu, that enabled the first vineyards to be planted south of Lima in 1548. As the conquistadores ventured farther south and east, grape growing and winemaking spread into Chile and northern Argentina. Pedro de Valdivia, one of Pizarro's most trusted officers, settled Santiago (in 1541), La Serena (1544), and Concepción (1550). As he moved south, he was met with brave resistance by the native Mapuche, who ultimately killed him before he could cross the Bío-Bío River. He left a legacy of large-scale viticulture. By the late sixteenth century, Chile had widespread vineyards, producing wines from criolla varieties such as Pais (Criolla Chica), Muscatel (Muscat), Tortontel (also known as Torrontés Riojano), Albihio (Albilla), and Mollar. Viticulture continued to expand in during the sixteenth and seventeenth centuries. By the time Chile declared independence in 1810, wine was culturally ingrained, especially around the silver mines of La Serena, where the miners were notorious for their insatiable thirst. Early Spanish missionaries also cultivated grapes. A Jesuit priest, Francisco de Carabantes, is credited with introducing the first grapes, likely Pais, to the region that is now Chile in 1548. In 1556, Juan Cedron, a Spanish missionary, made the trek from La Serena over the Andes to Santiago del Estero in northern Argentina, carrying cotton seed, grain, and vine cuttings, and so became Argentina's first winemaker. As in Chile, the first grape planted was likely Pais, possibly along with other criolla varieties. Adapting Inca irrigation methods, the local Huarpe tribes had harnessed the Mendoza, Tunuyán, Atuel, and Diamante rivers, allowing for the agricultural cultivation of the surrounding Mendoza region. Records attest that vines were well established in Mendoza by the sixteenth century, and while wines were made for local consumption, word spread as far as Buenos Aires that Mendocino wines were very good. Eighteenth-century records attest to a commercial wine trade with Buenos Aires. Jancis Robinson, in her celebrated Oxford Companion to Wine, observes that the traditional explanation for rapid expansion of viticulture was that the Catholic conquerors required a ready supply of sacramental wine, and that missionaries therefore played a central role in establishing vineyards. She notes, however, that there is little evidence to support this view and that most of the early vineyards and winemaking attempts were secular. She also points out that the economic dynamics, including the cost of importing wine and the difficulties of transporting it over land, resulted in the early Spanish conquerors' realizing that they would need to establish local vineyards if they were to continue to enjoy their wine. All these efforts came to the notice of the imperial powers in Spain. To protect domestic wine producers and merchants, the Spanish restricted wine production in their New World possessions, effectively freezing any further secular development of viticulture in Mexico. This move inadvertently provided an incentive to Peruvian producers, who soon became the dominant wine suppliers to most of South America. By the seventeenth century, Jesuit missions along the coastal valleys of Peru had become the most important centers of viticulture in South America and remained so until other regions developed their own industries. The arrival of grapes in Brazil was slightly more recent. Brazil was claimed by Portugal in April 1500 with the arrival of a Portuguese armada of thirteen ships and more than one thousand men, commanded by Pedro Álvares Cabral. He disembarked at what is known today as Porto Seguro in northeastern Brazil. In 1532, the first vines were planted by Martim Afonso de Sousa, in São Vicente in the southeast, but they did not thrive. He had greater success in 1551 in Tatuapé, São Paulo. When the Jesuits arrived in southern Brazil in the 1620s, Roque González de Santa Cruz, with the labor of the native Guarani community, expanded and maintained the vineyards in Rio Grande do Sul. The history of winemaking farther south in Uruguay is more obscure. Although there are local records documenting that Spanish settlers brought the first grapevines to Uruguay during the colonial period, there are no further references to viticulture in the region until the end of the nineteenth century. Farther north and east, viticulture was introduced to Venezuela in the 1520s by the Spaniards in the cities of Coro (the capital of the state of Falcón and the oldest city in western Venezuela) and in Cumana (the capital of the state of Sucre, east of Caracas). Wine production in Bolivia was introduced by the Spanish and Portuguese in the late fifteenth century, with the first vines being planted in Mizque, in the department of Cochabamba, and later extending to Camargo in Chuquisaca. In 1584, grape production finally arrived in Tarija, currently the largest grape-producing region in Bolivia. I could find no definitive written history for viticulture in either Colombia or Ecuador, but presumably their plantings of vines have similar origins. The modern evolution and reshaping of wine culture among the continent's "big four" producers (Argentina, Brazil, Chile, and Uruguay) are intriguing stories. As in Spain before the Franco era, the wine producers of Chile, Argentina, and Uruguay focused on their domestic markets. In Chile and Argentina, this was in part a result of social and political factors that contributed to closed markets until the 1990s. But with a sharp decline in the regional consumption of wine and the formation in 1991 of the Mercosur free-trade association and its subsequent strategic wine plan, growers across the continent were forced to expand their view to include international markets and to redefine their quality standards. Argentina, Chile, and Uruguay had very healthy per capita wine-consumption figures going into the 1980s. The average Argentinian consumed more than 90 liters of wine every year; Chileans were drinking 55 liters apiece, and Uruguay's population enjoyed a healthy 33-plus liters. By the late 1980s those numbers had plummeted: Argentina was down to less than 50 liters per person, Chile to 25, and Uruguay to 30. Contemporary per capita consumption remains much lower than in the 1980s, at around 26 liters in Argentina, 17 liters in Chile, and 26 liters in Uruguay. The reasons for this downward spiral included increasing consumption of other beverages (such as beer, spirits, and sodas); economic crises; and, in Argentina and Chile, government policies that did not favor wine producers. Draconian reforms of drinking and driving laws effectively restricted market growth. Faced with domestic markets that were no longer able or willing to gulp down all the wine that was being made, producers had to consider alternatives. In Argentina, which even now exports less than 30 percent of its wines, these adjustments entailed changing wine styles to win over foreign palates while making the domestic market more sophisticated. Producers in Brazil and Uruguay did the same. In Chile, the need for change was more urgent, as 70 percent of the country's wine was produced for overseas consumption and hence needed to be reshaped into export-friendly styles. In all four countries, much of this change was accomplished by varying the grape selections. However, in the end, all required outside help to revamp their wine industries. Chile's success as a modern wine exporter is widely credited to the arrival of Miguel Torres from Spain's Penedès region. At the wish of his father (Miguel Torres Sr.), he explored Chile, accompanied by the Chilean enologist Alejandro Parot (a classmate at the University of Dijon). He was so impressed with the natural conditions that he discovered-a diversity of microclimates and a relative absence of vine diseases-that he purchased an old winery in Curicó in 1979, calling it a "viticultural paradise." Recognizing an immediate need to raise the game, he imported stainless steel tanks for temperature control and cold fermentations, oak barrels, and other equipment from Europe and went to work in the vineyards planting and caring for French varieties. He soon made an indelible mark on Chilean viticulture. Encouraged by his success and by government policies that were opening up the market, other European-sponsored enterprises soon followed, among them Los Vascos (a joint venture established by Chile's Eyzaguirre family and the Rothschilds of Bordeaux), Hacienda Araucano (established by Bordeaux's eminent Lurton family in 1988), and Lapostolle (the Chilean vision of the Marnier-Lapostolle and Rabat families). This enormous period of advancement is referred to as "stage 1" by Rafael Guilisasti, vice chair of the board of the huge Concha y Toro wine company and a proprietor of Emiliana Vineyards. Stage 2, from the mid-1990s to the early 2000s, was marked by a planting explosion that doubled the acreage under cultivation (from 134,400 acres to more than 270,000 acres) using better grape varieties and clonal selections. Also crucial to this expansion was the discovery of new growing areas, spearheaded by Pablo Morandé's pioneering entry into Casablanca in 1982. This encouraged pushes by others into San Antonio, Elquí, and the cooler subregions of traditional areas such as Colchagua and Maipo. Subsequent advances in viticulture have been led by vineyard mavens such as the biodynamic guru Álvaro Espinoza and the terroir whisperer Pedro Parra. As a result of these developments, Chile is experiencing what we might call stage 3 in its progress toward a bright wine future. On the other side of the Andes, the situation in the 1970s and early 1980s was equally bleak. Argentina's military government had incurred large amounts of debt with botched projects, corrupt political dealings, the Falklands War, and the state's expropriation of private entities. By the time democracy was restored in 1983, unemployment was skyrocketing, wages were plummeting, and inflation was on the rise. Argentina simply didn't have the means or leadership to recover. In 1989, with a declining gross domestic product and inflation in excess of 5,000 percent, the economy collapsed. This collapse dramatically slowed wine consumption and led to a substantial government-subsidized pull-up of older vineyards. Sadly, this effort led to the destruction of much of the stock of old-vine Malbec, a loss from which the Argentinian wine industry has taken decades to recover. The Catena family of Mendoza is correctly credited with helping to revive the industry. Nicolás, the patriarch of the clan, spent time at the University of California, Berkeley, in the late seventies. During numerous visits to the Robert Mondavi Winery, he shared quality time with the late Robert Mondavi and learned the growing and winemaking techniques of the Napa Valley. When he returned home to take over the family winery in the eighties, he was determined to build Mendoza into an internationally renowned wine region. He embarked on this effort with the assistance of the renowned winemaker and consultant Paul Hobbs, a classmate of his brother Jorge at UC Davis. With Paul's insistence and Nicolás's persistence, things changed. They harvested smaller crops, restrained vineyard vigor, reduced and carefully timed vineyard irrigation, and implemented cleaner practices in the winery and the cellar. Hobbs became so enamored with the process that he put his money where his mouth was and started his own winery, Viño Cobos, with two Argentinean partners, Luis Barraud and Andrea Marchiori, in 1998. He continues to consult for a dozen or so Argentinean wineries and imports several lines into the United States. While Nicolás Catena was getting his bearings in Mendoza, Arnaldo Etchart of the Salta region was determined to improve his red wines by tapping the skills of the Bordelais wine expert Michel Rolland. The impact of Rolland's 1987 visit went beyond anyone's expectations. Like Paul Hobbs, Rolland was inspired to invest heavily in Argentina. His projects range from Yacochuya, a Salteña project he runs with Arnaldo Etchart, to his game-changing Clos de los Siete project, involving several wineries in Mendoza. Together, Hobbs and Rolland, along with the Catenas and Etcharts, have led the regime change in Argentinean winemaking. In Brazil and in Uruguay, the governments were among the principal players responsible for moving the industry beyond viño común, the "common wines" or table wines of the past, to the fine wines that are increasingly becoming renowned and opening the markets to export. Unlike Chile and Argentina, where vineyards are planted a lot of traditional European wine grapes (species Vitis vinifera), Brazil and Uruguay are still planted predominantly with North American native (Vitis labrusca) and hybrid grapes. Introduced at the end of the nineteenth century, these varieties still account for over 70 percent of Brazil's production and a similar percentage of Uruguay's. In an effort to ameliorate quality and open the markets, both countries went through government-endorsed and partly government-subsidized "reconversions," in which vineyards were dug up and replanted with different vines. In Brazil, this reconversion was nominally voluntary, although in practice it was essentially forced upon the industry. Until the late 1960s, most of Brazil's wine was common wine, produced by cooperatives. They used the American native and hybrid varieties, which were commercially popular for their ability to produce abundantly in Brazil's climate and their multiple uses (juices, concentrate, jellies, etc. ), and the only winemaking expertise was domestic. In the ensuing years, wine companies from France (Pernod, Möet &amp Chandon) and Italy (Martini and Rossi, Cinzano) entered the market and replanted vineyards with quality vinifera grapes. In the years that followed, the combination of a tough economy and political policies began to force the hand of the grape growers, making selling grapes to the co-ops less appealing. Some growers started to work with Brazilian wineries that were expanding and focusing on quality (such as Salton, Miolo, and Casa Valduga), while others decided to try producing their own wines. It was these independent growers and producers who took the first steps toward establishing a premium wine industry, even sending their children abroad to take enology courses. Led by visionaries such as Adriano Miolo, Lidio Carraro, and Flavio Pizzato, Brazil's industry began to reinvent itself in the late 1990s and early 2000s and showed the potential to produce world-class wines. Though fine wines represent only a small portion of Brazil's output, they are welcome entries on the world's wine shelves and are becoming more widely available. In Uruguay, although domestic wine consumption expanded from the 1950s until the late 1970s, it had dropped precipitously by the 1980s. Faced with a domestic decline in consumption as well as the prospect of the more open international market of the Mercosur, producers saw that they had two options: quit, and cede the market to competitors from Chile and Argentina, or else boost their quality and try to win back the domestic market. As in Brazil, this decision resulted in "reconversion." In the late 1980s and early 1990s, almost all growers and wineries took advantage of government incentives to pull up inferior Vitis labrusca grapes and replant with Vitis vinifera. However, the benefits of these programs were limited because the government sponsored improvements for fruit only-not for rootstock replacements or any winery improvements. Nevertheless, the policy had a momentous effect on Uruguayan wine production. Led by the energetic and determined Reinaldo de Lucca, who went to Montpellier to study enology (and who today owns a bodega bearing his name), better grape clones, starting with Tannat (the signature grape of Uruguay), were brought over from France, quarantined, heat-treated against viruses, and planted. De Lucca still runs a nursery that promotes Uruguayan grape diversity, and he is the country's leading importer of plant material. Uruguayan winemaking entered a second phase of improvements as an increasing number of producers committed themselves to quality production, including Daniel Pisano, Francisco Carrau, and Fernando Deicas. Although there are fewer than two dozen wineries today that concentrate on exports, and perhaps twice that number focusing exclusively on vinifera-driven quality wines, the momentum is palpable. Modern refinement of grape growing and winemaking in South America has followed a track parallel to that of other regions that emerged from introversion and obscurity: Spain, South Africa, Portugal, and even Australia in the era before Rosemount and Penfolds. The chapters that follow explore these developments in more depth. The most comprehensive guide to the wines of the entire continent, Wines of South America introduces readers to the astounding quality and variety of wines that until recently have been enjoyed, for the most part, only locally. Master Sommelier Evan Goldstein leads wine enthusiasts on an exciting geographical journey across ten countries, describing the wines, grapes, and regions of each. Goldstein begins the tour with a continental overview, discussing the arrival of the vine and wine culture, surveying the range of grapes planted and cultivated, and summarizing the development of modernday viticulture and winemaking. 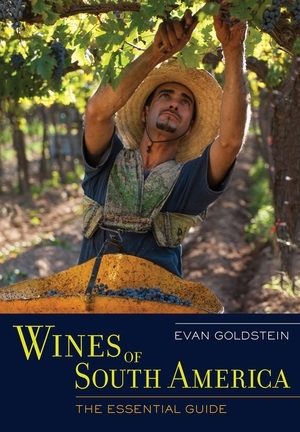 He explores the two giants of the continent, Argentina and Chile, in expansive chapters that cover their unique histories, wine regions, wine styles, prominent grapes, and leading producers. Goldstein covers the evolving industries of Brazil and Uruguay and discusses the modern-day activities in Bolivia, Colombia, Ecuador, Paraguay, Peru, and Venezuela. Up-to-date maps, several engaging photos, and pertinent statistics support each section, which also feature lively profiles of key individuals and wineries that have influenced the development of the craft. A closing chapter is devoted to food in South America, with specific information on wine country dining and leading chefs and restaurants. The author provides practical advice for travelers, an appendix of available resources for learning more about the wines of each region, and lists of ‘top 10’ wine recommendations for quick reference. Master Sommelier Evan Goldstein is President and Chief Education Officer at Full Circle Wine Solutions in San Francisco. He is the author of Perfect Pairings: A Master Sommelier's Practical Advice for Partnering Wine with Food and Daring Pairings: A Master Sommelier Matches Distinctive Wines with Recipes from His Favorite Chefs, both published by UC Press. 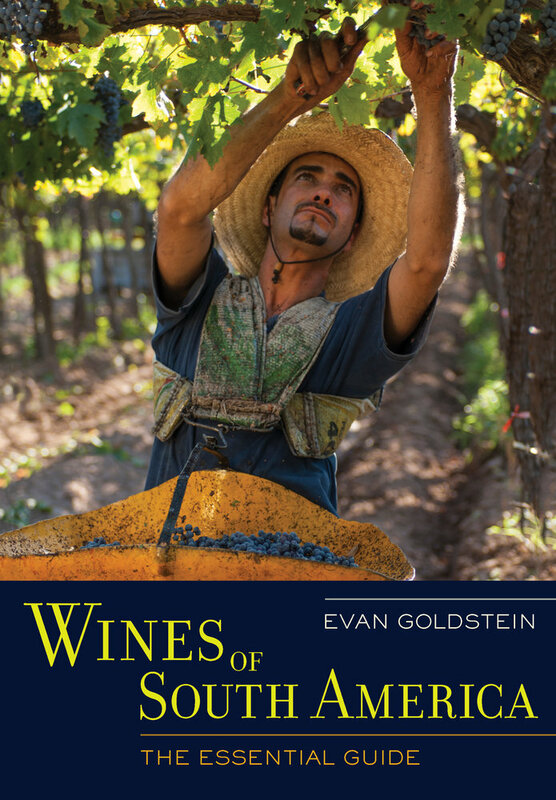 "California-based Master Sommelier Evan Goldstein spent nearly five years researching, traveling and tasting to write this book. Mr. Goldstein's diligence—and mileage—paid off with a highly readable and thorough reference book and travel guide with no contemporary equal. . . . Fans of South American wine will likely consult this source over and over again."